I love it when the magic of design comes together for a client and brings out a deep connection between their life & their home. 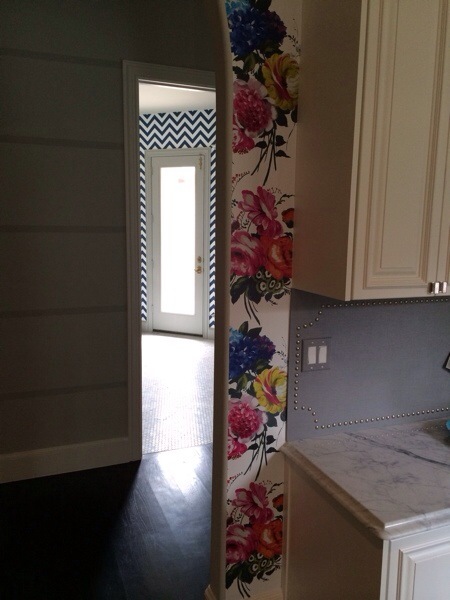 Today, I’m offering you a sneak peek inside a recent installation for one of my clients. It’s a gorgeous home. It’s been such a treat to work with this family. Her husband is a very talented custom builder & they both have impeccable taste. Our collaboration has brought forth some beautiful fresh results. 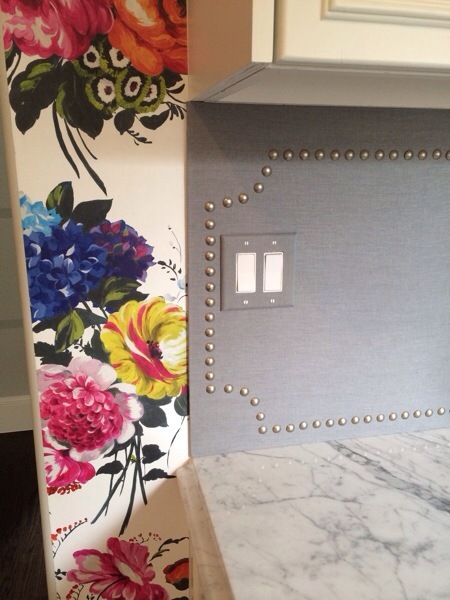 Below are a few photos I snapped with my iPhone as we were installing some of their wallpapers & drapery treatments. The Designer’s Guild paper we chose for their catering kitchen captured my client’s heart & she couldn’t wait to get it installed. 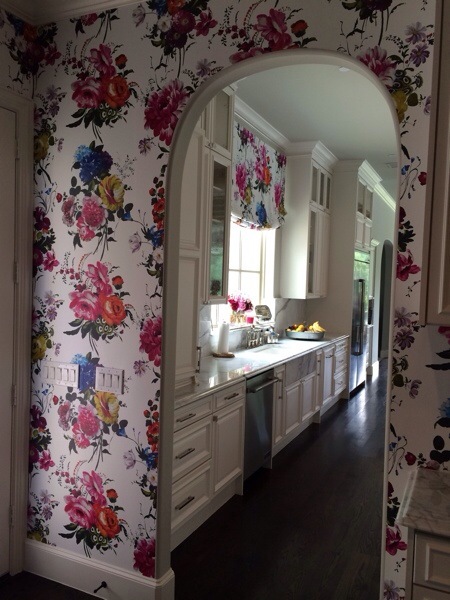 The blue hydrangeas in the bold & colorful floral pattern reminded her of her late mother & she knew she would enjoy spending time in there each day. 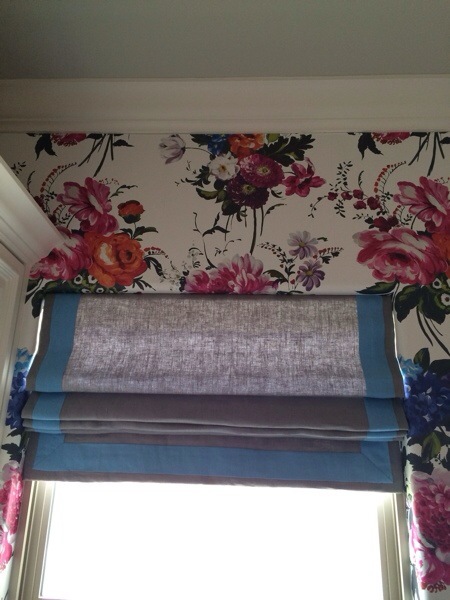 We used a simple gray linen fabric with a contrasting sky blue band on the Roman shade to compliment the bold wallpaper. View from the catering kitchen into the main kitchen. The catering kitchen has a built in desk area so we created an upholstered cork backsplash & framed it with a simple nail head design. 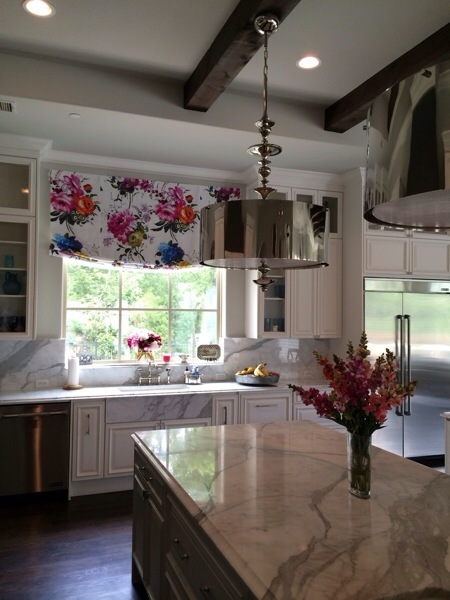 We carried the pattern into the main kitchen in fabric on a relaxed Roman shade over the kitchen sink window. 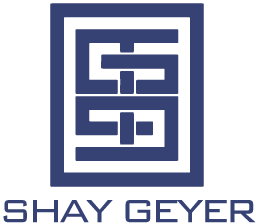 I hope you enjoyed this sneak peek into my project! There’s much more to do so stay tuned for more updates!